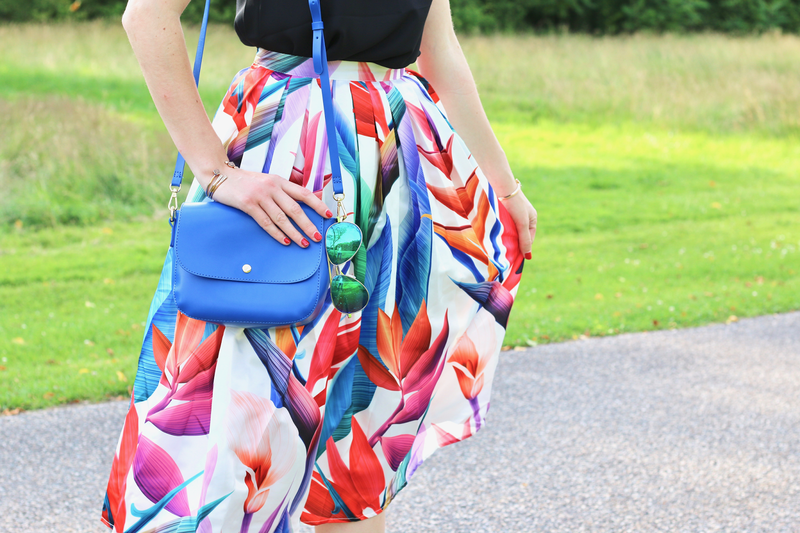 Bird-of-Paradise Skirt + 3 Books I Read This Month. Bird- of-paradise have always been one of my favorite plants. Growing up, my mom had a big painting hanging in our living room of these colorful flowers, so it sparked my interest in them from a young age. When I saw that this skirt was just covered with them, I knew I had to have it! Thank you to Nicholle from Nicholle Sophia for taking these photos! Good morning from Maine! Being new in radio, I don't really get time off at my job this year, but my boss gave me Sunday off so I was able to come home for a very quick trip Sunday/Monday for my mom's birthday, which is today. 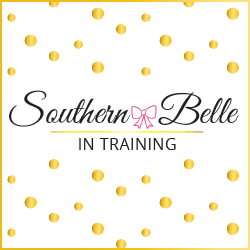 (If you wish her a happy birthday in the comments she will see it- she's one of Southern Belle in Training's biggest fans!) I'm heading back to Vermont tonight, but hoping to stop first in Manchester, NH, to do some shopping at stores that we don't have in the Burlington area! *Good Luck by Whitney Gaskell: This book is what I would categorize as a "classic beach read." It's about a woman named Lucy, who by complete chance ends up winning a huge jackpot in the Florida lottery. The lottery ends up changing her life a lot more than she anticipates, and through a series of new experiences and lessons she learns all about the ups and downs of being a lottery winner. I didn't love this book but I didn't dislike it either. This would be a good one to take with you on a beach or lake house vacation if all you're doing is reading lots of books for a week, but it's not memorable enough to read if you don't have a lot of time to read for fun. *Beach Town by Mary Kay Andrews: I was initially really excited about this book, because in May's book review post I had read my first Mary Kay Andrews book and really enjoyed it. Unfortunately, this one was really a snooze. I only finished it because I only don't finish books unless they're terrible, but by the end I was kind of forcing myself to get through. This book is about a woman named Greer who works as a location scout for Hollywood movies, and she is sent to a remote beach town in Florida to scout for an upcoming movie. The movie ends up shooting there, and over time a complicated romance and some family drama develops for Greer outside of her crazy work life. I thought this book would be so fascinating being about an old Florida beach town and the movie industry, but I found it to be so predictable and honestly quite boring. I wouldn't recommend it! *Touch and Go by Lisa Gardner: I decided to check my first thriller ever out at the library after reading so many of Caitlin from Southern Curls and Pearl's book reviews. She has raved about the thriller genre, and Lisa Gardner as an author, so I decided to try one of her books. And OMG- I LOVED this book! I stayed up until almost 2 am reading it the same night I brought it home from the library. This was a very intense book with a lot of graphic violence scenes, but it had the most insane plot. I also liked Touch and Go since it was set in New England. To say a little bit of the plot without spoiling it: an entire wealthy family in the Boston area is kidnapped one night, with no ransom and no leads on who might have done it. This book goes back and forth between the perspective of the kidnapped wife, and one of the female private investigators who is working on the case back in Boston to find the family. Just wanted to remind y'all as well that the Nordstrom Anniversary Sale giveaway that I'm hosting with several other bloggers, which I first posted about last Monday, is still going on!! It's not too late to enter. This giveaway is open internationally and runs until 7/24. Winner will be announced here. Good Luck! Tomorrow on the blog I'll be sharing a review of 2017's most popular lip product: LipSense!! I hope many of you will find that post to be helpful. And in Wednesday's Midweek Ramblings I'll be reviewing my NSale purchases! Tomorrow I'll be sharing an honest review post of LipSense - which might be 2017's most talked about beauty product! And then on Wednesday I'll be reviewing my NSale puchases in my Midweek Ramblings post! Such a cute and fun skirt for summer! I love bright skirts with black tops. It's such a bold but wearable outfit combo! 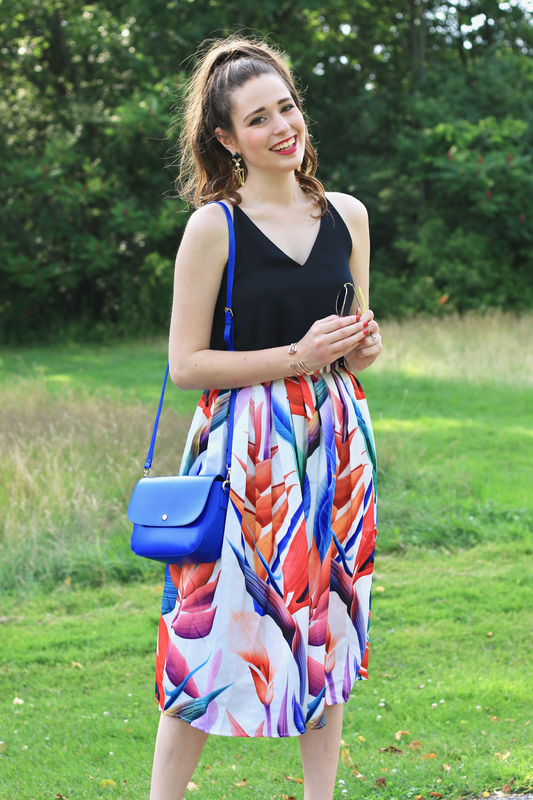 This skirt looks so cute on you, Annaliese! Touch and Go sounds so good- I need to check that one out! Such a cute skirt! Happy birthday to your mom!! I love this skirt! The pattern is so beautiful. That skirt is beautiful, and I love that it reminds you of a painting ;) I hope that you had a great visit home! Also, definitely appreciated the honest book reviews. I don't get to read as much as I would like, so when I read, I want to make it count. Wow, you are totally rocking that skirt!! I don't think I can wear such pattern but I'm totally loving the way you rock it! 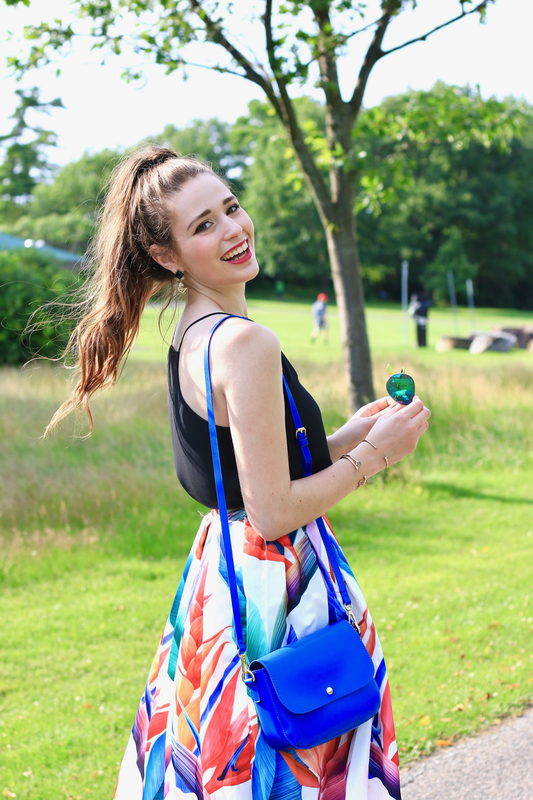 I love the blue bag with this look! That skirt is so flattering! 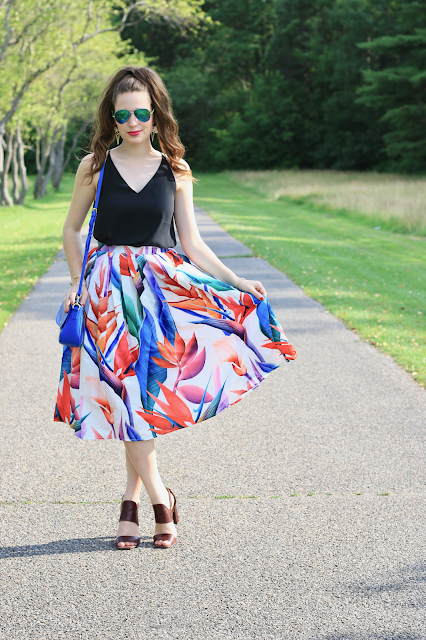 That skirt is incredible — looks like a watercolor painting! Love how to gives you a waist. Love how vibrant this skirt is!! It looks so stinkin' cute on you! You look amazing, I love that skirt its to die for! Love the skirt! And great that you were able to go home and visit your mom - happy birthday to her! This is such a cute skirt! I love this look on you! I'll say it again: this skirt is perfect for you! Happy belated birthday to your mom!